A balanced scorecard is an effective management system that helps organizations better accomplish their goals. This is done by improving their communication with employees about what is being accomplished, aligning their day-to-day work with the main strategy, effectively prioritizing projects, and using accurate measurement tools to help monitor the progress being made toward the main goals. When done correctly, this system can dramatically improve how organized a company can be. The benefits of this are discussed in our free organization guide. 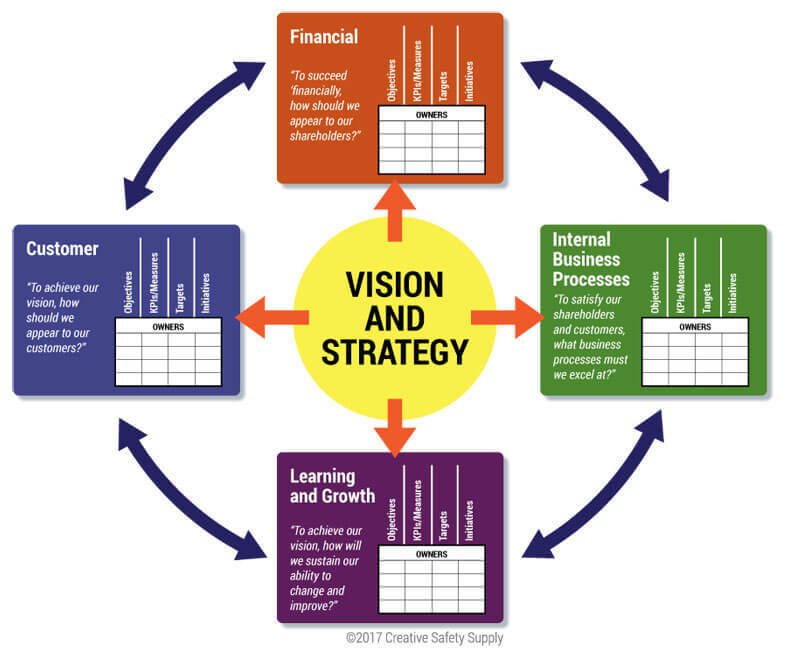 The balanced scorecard management system can be used effectively in just about any type of business, but it is especially common in manufacturing, warehouses, and construction sites. It has been effective for non-profits, government agencies, and a variety of other industries. In practice, the balanced scorecard system helps link the big picture ideas with the frontline operational elements. This has been shown to improve efficiency and allow facilities to increase productivity and accomplish the most important goals as quickly as possible. The focus on efficiency and productivity is one of the reasons why balanced scorecards are an excellent system to compliment lean 5S strategies. 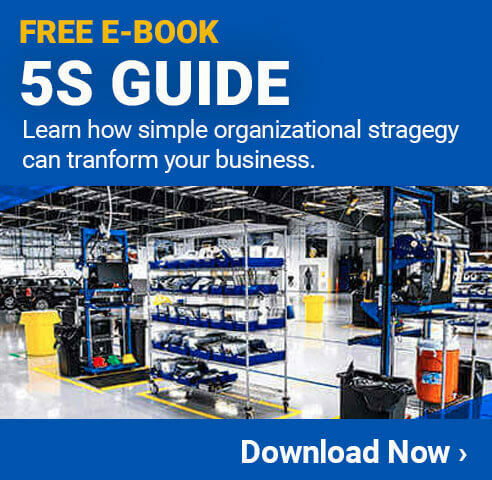 Companies looking to take advantage of these two beneficial methodologies could benefit from a Lean 5S Guide, which is offered for free HERE. Mission Statement - This is the overall purpose of a company. It can also be broken down to a facility level for multi-location companies. Company Vision - This is the long-term goals for the company's future. Core Values - Core values are an essential component of most businesses and are used to identify the company's important beliefs. Strategic Focus Areas - These are the themes for what types of things need to be accomplished within a company. Objectives - Objectives are generally linked to continuous improvement strategies. Continuous improvement is a powerful concept, which is at the heart of kaizen. 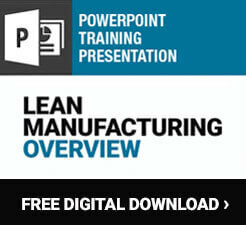 You can learn more about kaizen and its many benefits in the free guide offered HERE. Measures - Key performance indicators are used to measure the performance of an area. Targets - People work to reach targets, which are defined performance levels. Initiatives - Projects are set up to help departments reach their established targets. These are all concepts used in a wide range of business management strategies. In many cases, however, each of them is kept separate, rather than working together toward larger or longer term goals that a facility hopes to reach. This is one of the many areas where balanced scorecard can take established ideas and make improvements on how they work in practice. When implementing balanced scorecard, you may encounter many unfamiliar terms or terms used in an unfamiliar way. Taking the time to understand these terms will make the implementation process faster and easier. Even those who are already using this system can benefit from reviewing the commonly used terminology. Organizational Capacity - This was known as "Learning and Growth" in the past, but has since been updated. It is looking at the organizational performance as human capital, infrastructure, technology, and culture. These are essential for the highest level of performance. Financial - This term refers to an organization's financial performance. When working toward large goals, it is easy to overlook the financials that are involved, which can lead to significant problems. Customer - Anyone can be a customer when using balanced scorecard. The customer can be an internal department that relies on work from another department or the end customer who will buy the products. Internal Process - This is the process that looks at all activity with quality and efficiency in mind. Internal process is essential for ensuring great quality and exceptional results. Strategic Objectives - These are activities focused on continuous improvement. The concepts listed above such as "mission" and "vision" are applied to specific strategic objectives such as increasing overall revenue and improving customer confidence. Strategy Mapping - Strategy mapping is commonly used in the balanced scorecard system to help get a better understanding of how value is actually being created. It also helps to better communicate this information to the front-line employees. Measures - Measures are key performance indicators. They are looked at over time to determine whether progress is being made toward a specific goal. Cascading - Cascading means taking large-scale goals and objectives created at high levels of an organization and pushing them down to lower levels in an understandable and relevant way. The goals and requirements are "cascaded" down to other levels, or tiers, so each group has the right information about what work they should perform and goals they should work toward. Many other terms may be used when implementing and using the balanced scorecard system. Taking the time to learn more about this system as a whole and its terminology is worth it in the long run. The phrase "balanced scorecard" was first coined in the early 1990s, but the concepts behind this system have been around for quite a long time. Many people trace the origins back to the 1950s when General Electric began revolutionizing its performance measurement and reporting policies. The modern version of the balanced scorecard was officially developed by Dr. Robert Kaplan, a Harvard University professor. He worked along with Dr. David Norton to create the framework for balanced scorecard with the goal of having a better-balanced performance measurement system in place. Prior to this, most companies looked primarily at short-term financial performance as the primary, or even exclusive, measurement of performance. One of the first steps in improving performance measurement and achieving goals is creating a balanced scorecard. There are many ways to accomplish this task, and each facility will need to determine what strategy is most effective for them. One commonly used strategy is illustrated in the picture below. It shows the main vision and strategy in the middle and the four surrounding concepts (financial, customer, internal business process, and learning and growth) around the outside. The four concepts on the outside are then further broken down into the terms and ideas that were covered in the above sections. As you can see, the arrows point in both directions along the outside. This shows how each concept is connected to the others. While it may seem obvious, one of the most important things to remember is that each piece of this framework is just as important as the others. Only by having all these piece working together can an effective framework be put together. In the middle are the vision and strategy, which are the highest-level goals of a company. As you move to the outer sections and then the sub-sections within each, the information becomes more and more relevant to the front-line employees of a company. The following picture is a great example of what a good balanced scorecard will look like when completed. The information is broken down into sections so they can be easily understood. The sections can either be filled out right from the beginning or some can be left blank until the various departments or interested parties can fill in their piece of the process. 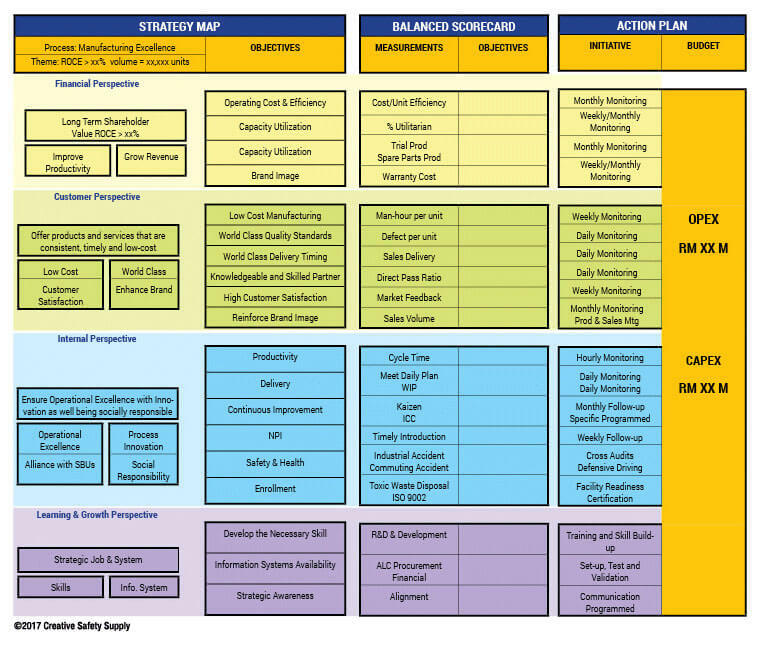 At first glance, there is no doubt that the balanced scorecard appears complicated. There is a lot to this process, and this document is really just an introduction. Companies that truly understand and properly implement the balanced scorecard management system find they can not only improve progress toward their most important goals, but also have employees who are more engaged. This system helps them work harder and smarter so they can meet their own personal goals, which are directly linked to the overall goals of the facility. In the end, the balanced scorecard system generates results that simply weren't possible without it.